2012 is coming to an end and the world rolls . It's time to take a look back at what I've been up to the last twelve months. After an amazing 2011, 2012 had a high standard to live up to. Not sure if it did or not. I can say it had a very lackluster feel to it. The big themes of 2012 were Asian travel, exercise, and the health of family members. January: I set a goal to post more in 2012, a goal I did not achieve. I resolved to become more optimistic in 2012, another goal I did not achieve. I asked for ideas for how to become more optimistic and for a new favicon for Homer's Travels ... and got few responses. Back strengthening exercises resulted in better sleep. Push ups started causing shoulder aches ... aches that would turn out to be rotator cuff tendinitis. I finished documenting our Route 66 & California trip with a comparison of the Camino and Route 66. February: The month started with weird weather that interfered with plans. Blood tests came back within range, a good thing. My knee, that had been bothering me since my 2011 Topa Topa hike, began improving this month. The Wife ice fished while I overdosed on homemade sugar cookies. I ended the month lamenting the lack of posts that didn't exist. Unfortunately that perception was more of a prediction as the number of posts dropped off as the year continued. March: We started the month with a trip to Galena, IL which helped my mood a bit. I bought a new camera that could withstand the elements. We went to see the sandhill crane migration for the second time, this time seeing a rare whooping crane. I conducted the changing pictures experiment. My walking routine, that started in December 2011, continued to progress nicely. April: We curled for the second time in our lives, this time with no injury. I broke the 2,000 mile walking mark. I realized that hiking/trekking is what I like to do and I added the Appalachian Trail to my plans. I achieved my goal of doing 100 push-ups - then I quit to let my shoulder heal. The month ended with a visit to an ax murder house. May: In May I started my ab work which is slowly doing its job of flattening my stomach and strengthening my lower back. I celebrated my Caminoversary. I finally finished the Oak Creek Trail. Other hikes this month were limited by the hotter than normal temperatures. Memorial day was spent remembering one of the Wife's uncles who had passed earlier this year and remembering all the people who have given their lives for our country. June: Best way to start the month is to watch three television bees and feeling pretty stupid afterwards. I tried to plant poppies in iia pair of boots with less than positive result. We lost a great author when Ray Bradbury passed. I paused my exercise routines in preparation for our Asian trip and because of persistent aches and pains. At the end of the month we traveled to China and began our Asian Adventure. July: We returned from our Asian Adventure and spent a few weeks readjusting to being home. The Wife was sick the week following our return. I had a hard time getting back into my groove. Sitting on the couch and watching the Olympics was fun but didn't help my mind sync up. Looking for a dog came and then went without resulting in a dog. August: This month started with a scare when my Mom went to the hospital with infection on the brain. We lost a great explorer in Neil Armstrong. This month, and the next four, I would slowly post about our Asian Adventure. Frankly I don't think my soul was in my writing- a much different feeling than I had after my 2011 Camino and our Route 66/California vacation. September: The month's post were dominated by Asian Adventure posts. I did take time to post about an unsuccessful attempt to buy a new back pack for my 2013 Camino. I also talked about restarting my exercise regimen and some of the new issues that popped up soon after including plantar fasciitis. I also started riding my bike twice a week. October: What a month. The dominant thing of the first half ... well I'm not going to post about it. Suffice it to say that there was a family issue that threw everyone into turmoil that has persisted until now. This month was also the Wife's fiftieth birthday, a milestone I will reach next year. Next the Father-in law scared everyone and went to the hospital to have a pacemaker/defibrillator installed. To finish the month off my Network Storage crashed ... hard ... and I lost a large chunk of my pictures. Pretty sure October was not my favorite month this year. November: The election came and went - Thank God! - and things did not change. My plantar fasciitis continued to bother me so I took the entire month off from walking - the second month of November where I didn't walk. A leaky dishwasher resulted in a whole new set of kitchen appliances. We celebrated a good Thanksgiving. December: Both 12/12/12 and the end of the world came and went. I finally finished chronicling our Asian Adventure. One adventure down, dates were set for my next and I bought airplane tickets for my 2013 Camino. I bought a new toy: a Nexus 7 tablet. A new toy didn't help much for my disposition. I was grumpy most of December. A couple days after Christmas we brought home a new dog. Santiago will probably dominate our household for a while. This year I hiked 589.70 miles. I would have topped last years 756.44 miles if it hadn't been for my plantar fasciitis. I ended up skipping about six weeks worth of hikes trying to heal my heel. I biked 468.31 miles. I have ridden almost as many times, and more miles, this year than the last four combined. I am slowly adding the miles to my biweekly rides though the cold and snow have put my riding on hold the last few weeks of the December. Snowshoeing ... zero miles this year. Winter 2011-2012 was just too dry. While we did get some snow in late December, it fell mostly in the city and the places I usually go to snowshoe got less, I suspect we will not get enough snow this year for any substantial snowshoeing. I read 10 books this year including my first ebook - the same number of books as last year. Not even close to the sixteen book goal I'd set for myself. Near the end of the year I was finding it hard to find books that interested me. I don't blame the books, I blame myself. I still managed to read about 4,409 pages - about 24% more than in 2011 but still far fewer than in 2010. Of course this doesn't include all the articles I read on the internet and in magazines (Wired and National Geographic mostly). I have no easy way to quantify these. This year we went to no concerts. Not sure this has happened to me for at least ten or fifteen years. Just didn't see any act that caught my eye ... or ear. The number of post this year, 113 including this one, was dismal. The lowest annual count since I started Homer's Travels. Longest writer's block ever ... or maybe I should just blame Facebook. 2012 ... felt mediocre, this despite the month long Asian Adventure. I guess I should have expected it as 2011, especially the summer, was so incredible. It's hard to live up to that standard. I felt we fewer little side activities this year, though I don't think I have evidence to back up that claim. The health scares for both the Mom and the FiL didn't help much for the second half of the year. While 2012 may have been mediocre, I did discover something important about myself. I discovered that hiking/trekking is what I really like to do. 2013 may be a bit more low key still. Yes, I will be going on my second Camino, but there are no other big plans coming ... at least not yet. I'm sure Iago will liven things up a bit. I have to change my expectations, I think, and let the year stand on its own without the shadow of summer 2011 hanging over everything. Maybe 2013 is when I move past the Camino and continue on to the next stage. I just have to keep on trekking and forge ahead to the next trail. May all your dreams come true in 2013. Book: Anne Applebaum's "Iron Curtain: The Crushing of Eastern Europe, 1944-1945"
After my last rather unsatisfying book, I scoured Amazon looking for my next read and came up empty. I think I was in a funk as nothing sounded interesting at all. When I got my new toy, I started looking into checking out eBooks from the library. The selection there was a bit lacking. Several publishers refuse to allow libraries to lone out their eBooks. Despite this I manage to find some light reading to test if I like reading books on a tablet. The light reading I checked out was Anne Applebaum's "Iron Curtain: The Crushing of Eastern Europe, 1944-1956 ". First I want to say that at first I wasn't sure about reading a book on a tablet but about half way through the book I was sold. The tablet is heavier than most paperback books but this particular book, 600+ pages, in hardcover would have weighed more I think. I didn't really notice any eyestrain or fatigue reading from the screen - I had the brightness down low and I read with grey letters on a black background which eliminated the flashlight in the face feeling the tablet sometimes has. I liked the experience. Now, onto the book. The book is a history of how the Soviet Union infiltrated and converted the countries it "liberated" from the Nazi during World War II into totalitarian communist countries. Since most of my school history classes never made it passed World War I, this book helped fill in a hole in my knowledge of history. Applebaum weaves an interesting tale of how one institution after the other is taken over by the communist parties and used to unsuccessfully indoctrinate the populace. It seems that no organization is too small for the Soviets to ignore - from the large like the radio and religion to the very small like scouting and women's groups. In the end the book gave me hope in human nature. After decades of propaganda and indoctrination the people of Eastern Europe managed to survive and regain their freedom - something few people ever expected to see happen. "The referendum was an important turning point, even more so than the parliamentary elections that followed. For one, it represented the dawning of a realization that would still take many years to sink in: propaganda had its limits. Not only Polish communists but communists of all kinds would eventually conclude that more did not mean better. More importantly, Poland's communists now knew they had no chance of a 'clean' electoral victory of any kind" - "Iron Curtain", Chapter 9: Politics, page 17 (eBook version). When I read this I couldn't stop thinking about all the political commercials and all the super-PAC money spent during the last American presidential election. It seems a lesson learned by the communists decades ago has still not been learned here in our own country. I enjoyed this book and I highly recommend it. Today we got a new family member. Almost three years since we lost Homer, the sounds (and smells) of a dog are once again gracing our home. 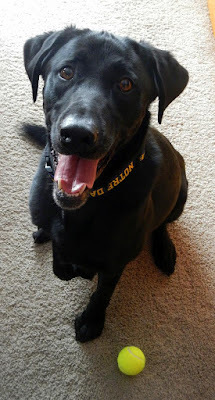 The new dog, a five year old black lab originally named Chalmers, has been rechristened Santiago (Iago for short). Santiago is a farm dog who, unfortunately for his former owners, had a taste for chickens. He'll have to learn how to be a house/backyard dog. This shouldn't be a problem since, due to his taste in fowl, he was confined to a pen most of the time. Having the run of the house and our backyard will give him a bit more space. He's already ran around the house a few times, knocked over the terracotta soldiers (none broken, all out of reach now), lifted his leg on the Christmas Tree (well, it is a tree), and rolled around in the snow. All part of getting adjusted to his new home. His owners say he is good on a leash. If this turns out to be true, and it seems to be true so far, I may do what I never did with Homer: take him on some of my hikes. This way I can get my walking and Iago's exercise done together. I also have to take him to the dog park, something I did with Homer only on rare occasions - he didn't seem to like being around other dogs, they annoyed him. He's a bit different from Homer. That is an adjustment I will have to make. I'll have to stop comparing him with Homer. That's habit that will be hard to break. and a gift card from Google Play (Google's equivalent of iTunes). In addition to this pile of awesomeness, Mom gave me a cool wireless remote outlet so I can turn things on without getting off the sofa, and cash (along with the aforementioned twizzler nibs). Camino cash from the in-laws who gave everyone their entire Christmas, Birthday, and Anniversary money for the year all at once making the MiL's life a lot easier. The last, very thoughtful, gift was from one of the Wife's nieces who gave me a bag of products for treating aches, pains, and sore feet and, to top it off, a bag of pixie sticks (there a joke there). My plan now is to carefully ration all the sugar I got for Christmas for as long as possible. I will update when I finish the last gram of sugar ... hopefully before I go into a coma. All in all a very satisfying Christmas. So ... How did Santa treat you? 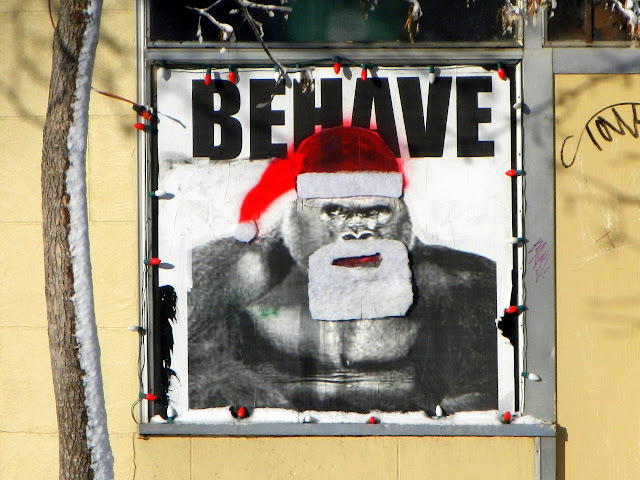 Enjoy your presents. Enjoy your feasts. Most of all, enjoy your family and friends. Santa Kong is coming to town ... so BEHAVE! On Wednesday night, and into the early hours of Thursday, we had our first snow of the season. The snow was accompanied with a blizzard warning. I got up Thursday morning not looking forward to shoveling the drift that inevitably appears in our driveway when there is even a hint of a breeze ... and the wind howled the night before. At first I was pleasantly surprised - only about six or seven inches of snow, easily handled by the snow blower our neighbor lends to us every year. My pleasant surprise didn't last long, and I should have known better, when the snow turned out to be a dense, heavy, wet, icy snow. I should have known better as the snow the day before was preceded by rain and sleet. The blower handled most of the work but the berms of snow piled in the driveway by the snow plows was rock hard and heavy. Despite wearing my back brace I ended up tweaking my back shoveling that icy mess. On Friday I went out for a walk. The snow that caused me grief the day before made everything look clean and fresh. Before I could start walking I had to chip the snow/ice off the parking meter. I ended up walking around 7.45 miles (12 km) through snow covered neighborhoods. Most of the sidewalks were cleared of snow ... exposing the layer of ice below. The walk was slow - hard to walk my normal pace when you have to take baby steps to keep from falling on the ice. Part of my walking route took me along the Field Club trail, a former railroad right-of-way that stretches 1.7 miles (2.7 km) from Vinton on the south to Leavenworth on the north. I was pleasantly surprised to see that it was also cleared of snow. 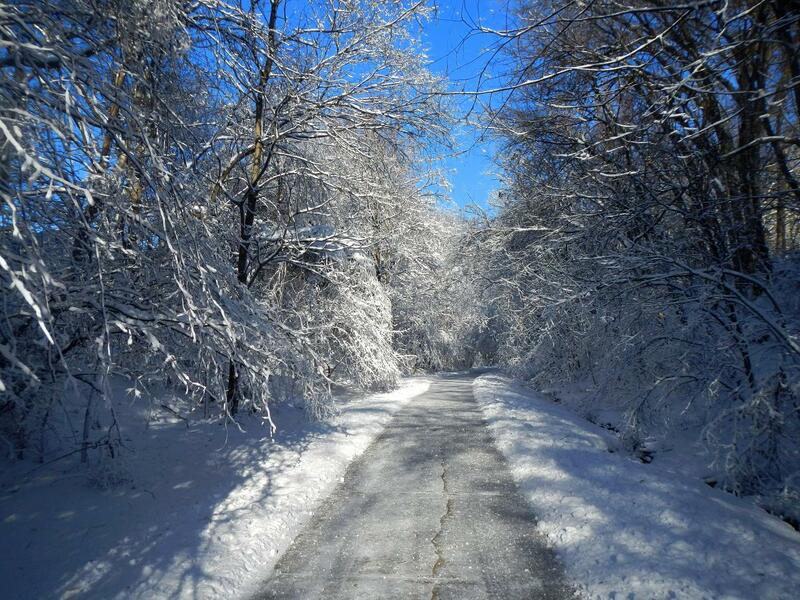 Part of this trail is lined with trees that were snow covered. This part of the walk revived my opinion of snow, an opinion that had taken a hit the day before while shoveling. 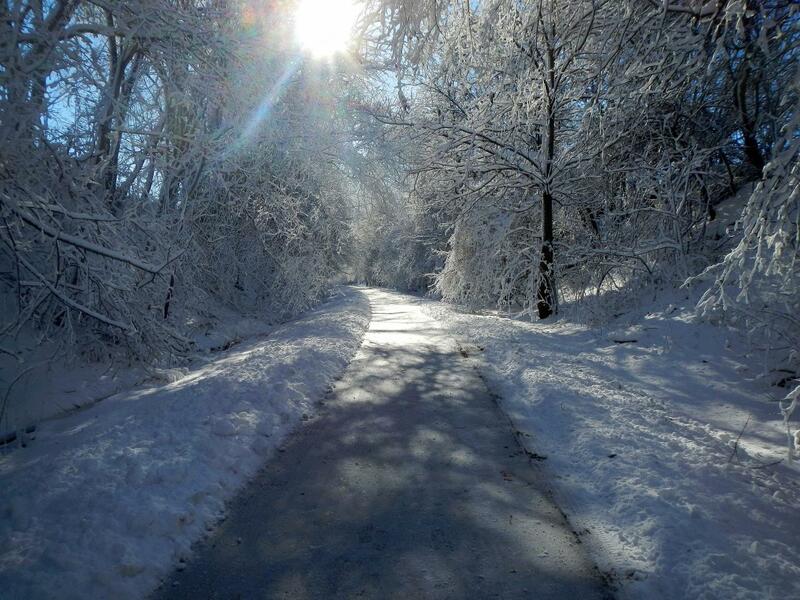 The sun through the snow covered trees on the Field Club trail. I have to admit I have a love hate relationship with snow. I wait for it with anticipation every winter and then, when it finally arrives, I am irritated that it's hard to walk on the icy sidewalks and the cold keeps me from riding my bike (it was 8°F (-13°C) yesterday morning). But then I see scenes like the pictures above and below, when I'm not staring at the ground watching for icy patches, and I forget all my irritation and marvel at the pristine beauty of winter. The icy Field Club trail lined by snow covered trees. It's the end of the Mayan Long Count Calendar. You know what that means, don't you? It means it's time for the Mayans to go to Staples-Depot-Max and buy a new Long Count Calendar. Now I'm going out to take my first walk of the new Mayan Long Count Year and carry on with my life. I went for a bike ride this morning. It was going to be a 25 mile (40 km) ride. When I plan out my rides I always watch the weather on the nightly local news to see which way the wind will be blowing the next morning. The past few nights there's been a new young weather guy filling in for the regular, experienced guy. His graphics said that there would be some wind coming from somewhere in the south to westerly direction and that later on it would be breezy. I have a strategy when it comes to biking. The main bike paths near my home go north and south. The direction I take depends on the direction of the wind. I start into the wind while I'm fresh and then, after turning around, ride home with a tailwind. Since the weather guy said we were going to have a southerly wind, I planned accordingly choosing a trail that heads south. The ride started out fine. It was a crisp late fall day. I was testing out some new toe warmers that I'd bought last week (Grabber Performance Toe Heaters that you stick on the toe area of your sock - too early to judge them but they need to warm up a little bit more). There was hardly a breeze at 6:10 AM when I started the ride. I reached the 12 1/2 mile turn around point, turned around, and ran smack dab into a headwind. Almost exactly when I turned around the wind started to pick up - much earlier than the weather guy said it would. It was not from the south, west, or south-west. The wind was from the north-west and it was blowing around 10 to 12 MPH at least. I ride a 21 speed bike. The wind was so hard I had to shift several gears lower than I usually do just to move forward and I barely did that at times. I had to stop and rest four times. I've never stopped for a rest on any of the other 33 rides this year. At one point the wind was so strong I was almost blown off the bike path. I cursed the wind - actually yelled at the top of my lungs - and I got off and walked for a half mile before it died down a tiny bit so I could ride the rest of the way home. I ended up averaging about 9.7 MPH, well below my average speed of 11 MPH. If I'd gone north it would have been a total different story. I would have ridden home with a nice tailwind. I managed to ride for 24.5 miles, close to my goal, but it was one of the most miserable rides I've had in a long time. Whaaaaa! I've been telling myself that when my laptop died I would look into buying a tablet. Well, my laptop hasn't died yet but the battery, which once lasted over four hours on a charge, is slowly dying, lasting only forty to fifty minutes on a charge. I finally gave in and, after Thanksgiving, I purchased a Nexus 7 tablet. First I have to say that I like it. This isn't my first tablet. I've gone through several iterations of Palm devices ending with the Palm Lifedrive. My Lifedrive died when I dropped it in Wal-Mart a few years ago. The Nexus runs the Android operating system (OS). It's a bit different from the Palm OS. There's been a little of a learning curve. The first thing is the Palm OS uses a stylus. Android is finger-centric. After using it a bit I've decided that my fingers are thick and clumsy. The past couple of weeks I've been playing around and loading apps. There are a lot of good apps out there ... and a lot of crappy ones too. A couple of the apps I've downloaded didn't work but have since been updated and work great. In other cases I haven't decided which is better, a custom app or just using the Chrome browser and just going to the website. So far the Nexus has been a pretty good laptop replacement. Its small size makes it convenient and eminently transportable. The size does have one slight inconvenience - I have to wear my glasses when I use the tablet. Not sure if this is the tablet's fault or just old age. Who am I kidding ... my eyes are old. The tablet allows me do do some things I couldn't do with my laptop. One of those is reading internet stuff and eBooks in bed. I can now download eBooks from the library to read. I can also read articles I've saved using Instapaper, a web service that allows you to save articles you find on the web (something I learned from the Best Man). I use Instapaper to save longer article I think might be interesting so I can read them when I have more time. Okay, time for a rant. Be warned. I went to our library website and looked at their rather limited selection of eBooks I found one that may be interesting and tried to check out/download the book. Oops, the book is not available. The library only has one copy and it's checked out already. What the heck?!? You only lone out eBooks books that can be copied easily, one at a time? I understand that book publishers wouldn't want libraries to lone out unlimited free copies of books but I would think that a library should offer say five copies. This way the waiting would be less and it would not eat into the publisher's profits too much. Rant over. There was a time that I considered myself an early adopter. I used to try to be at the bleeding edge. But that was many, many years ago. I've fallen behind in the last fifteen to twenty years. With the purchase of my Nexus 7 I am finally crawling my way into the twenty-first century. Well, it's starting. Camino fever. I'm getting that urge, that anticipation, I had when I started to plan my last Camino. The feelings now are different. I no longer have that anxiety I had last time. Planning for my first Camino I had so many questions. Would I be able to do it? Is my plan too ambitious? Am I packing the right things? Am I packing too much? Turns out the answers to these questions were Yes, No - the plan is too conservative, Yes and No - something to keep you warm when your sleeping would have helped, and No - you only tossed out around a pound of stuff along the way. This time around the anxiety is not of the same magnitude. I know what to expect and I have ideas on how to tackle the issues I encountered last time. Things like carrying my pack on the plane instead of checking it. Changing my shoes and insoles to help reduce the chance of tendinitis and blister issues. Packing merino wool t-shirts instead of the long sleeve shirts I took last time - wool doesn't smell as much when saturated with sweat and dry quickly. Packing a new rain jacket that hasn't lost its water shedding abilities like my old one. Packing trekking poles to help reduce the strain on my knees. There are other things I will change that I will probably post about in a future lessons learned Camino post. For now I want to talk about a couple things I have done to prepare. The first is I bought a new pack. I already posted about the failed Gossamer Gear attempt in September. Early November I ordered and received a GoLite Jam 35L. My first reaction was "Damn that thing is small ... and light." I was a little concerned about the small size. The GoLite Litespeed I took last time was around 38 liters. A few liters makes a difference. To assuage my fears I packed my new bag with everything I was going to take and found there was plenty of room. It might be a little tighter than my old one but it just means I have to be a little more orderly when I pack it to maximize the packs pockets. Last time I was amazed at the small pack carried by NV, a fellow pilgrim from Ireland. My new pack comes close to matching hers, it is just fine for what I need, and its small size will make it easy to carry on the airplane. Sometimes small is big enough, one of life's little lessons. One note about bad timing. Last week I got an e-mail from Go-Lite about the Jam being on sale for 40% off. I shot off an e-mail to see if I could get a refund. They do have a 30 day price match policy ... I bought my pack 35 days ago ... Sorry dude, no refund. The next step I've taken is to make airline reservations. In a way buying tickets is the most important part of doing the Camino - nothing like making a substantial, non-refundable purchase to motivate one to get'er done. Prices have gone up since I made reservations for my last Camino - going up by almost $200. A sign of our times I guess. The hardest thing was deciding the exact time for leaving and returning. I am coordinating my Camino with GV, another pilgrim I met last time and who, baring any unforeseen injury or circumstances, will be doing the 2013 Camino with me. Coordinating with another person adds a little extra complication in the planning but not too much to handle. We will be starting our Camino in Oloron-Sainte-Marie, France. We will follow the Arles route to the Spanish boarder near the pass of Somport. From there the route changes name to the Aragonés route following the river Aragón. The Aragonés route eventually joins the French Way, the route I walked last time, near the town of Obanos, Spain. I'm flying on the 5th of September (Omaha - Chicago - Madrid - the same flight I took last time). I arrive in Madrid on the 6th and I fly from Madrid to Toulouse, France. From there I take a train to Oloron-Sainte-Marie arriving sometime after 9:00 PM. I begin walking the next day, the 7th. From there I will be walking for forty days walking to Santiago de Compostela, Fisterra, and, eventually, Muxia before I am done. I will have six extra days to use for rest/recuperation/insurance/sightseeing along the way. Having extra days is reassuring since the Obanos to Santiago de Compostela stages I have planned out are fairly aggressive and may need to be broken up into a few more stages. I leave Santiago de Compostela on the 23rd of October and arrive home on the 24th. So things are proceeding. I'm starting to have flashes of excitement every now and then when I think of it all. Flashes of excitement and less, much less, anxiety. OK, one more epilogue. Why? I like epilogues. I like the sound of the word. Ep-i-logue. EP-i-logue. Ep-I-logue. Ep-i-LOGUE. I like the word. This was a marvelous adventure. Thirty-two days of awesome, and not so awesome, adventure. The variety of what we saw is hard to quantify. The pictures I've posted only scratch the surface. The things we saw: The Potala Palace, Pandas (both black & white and red), Terracotta Soldiers, the Forbidden City, the Great Wall, Mount Everest (from the airplane), the Tiger's Nest Temple, the Bhutanese Takin, The Taj Mahal, The Glass Palace, The Amber Palace, and Elephants. The great pieces of history keep going and going. It is almost too much to absorb really. Now that I'm home I keep catching myself seeing something on TV and saying "OMG I've been there!" I love that feeling. OK, I may not say OMG but that's how I feel at the time, like a giddy school girl at a Justin Beiber concert. People have asked what was the best thing. I honestly can't answer that question. There was just too much awesomeness to be able to pick. I loved the Yangtze river cruise and we are already looking into other river cruises. Buddhism, and places associated with it, is incredible while being so peaceful. Bhutan would have to be my favorite country - so peaceful and beautiful with wonderful people. China had so much to see and I know there is a lot I did not see in this large country. I probably didn't give Nepal a fair chance. India was amazing. The thousands of years of history we experienced marveled. I guess the one word that would sum up this trip is "Wow". China, while steeped in superstition is trying to be secular. When we entered temples in China our shoes stayed on. In Nepal, Bhutan, and India the shoes always come off. Slip on shoes would have been an asset. Also in China, there is only one time zone for the whole country which messes with your head when it's light at 4:00 AM in one part of the country and dark at 4:00 AM in another part of the country. The modern world, i.e. western culture, is everywhere. In Nepal and Bhutan you saw angry birds shirts, toys, and stuffed birds everywhere. Cell phones are ubiquitous in all four countries. Even so, everything still had a native twist it. Western culture is changing things not by replacing but by melding with what has always been there. We had seven different guides. I liked it better when there was one guide for the whole country like in China, Nepal, and Bhutan. The guide gives you continuity. Changing guides every day or so made things more difficult at times. I also preferred women guides over men. They seemed like they cared for you better. Nepal, Bhutan, and India have some of the most beautiful people in the world - I can vouch for the women and I'm sure the Wife will vouch for the men. In America we spend money on tanning booths and self-tanners to give us that dark, healthy glow. Starting in Nepal we noticed commercials for skin lighteners. Apparently dark skin is not popular ... in a part of the world where darker skin is the norm. Our guide in Delhi blamed this on the British and their standards for beauty. 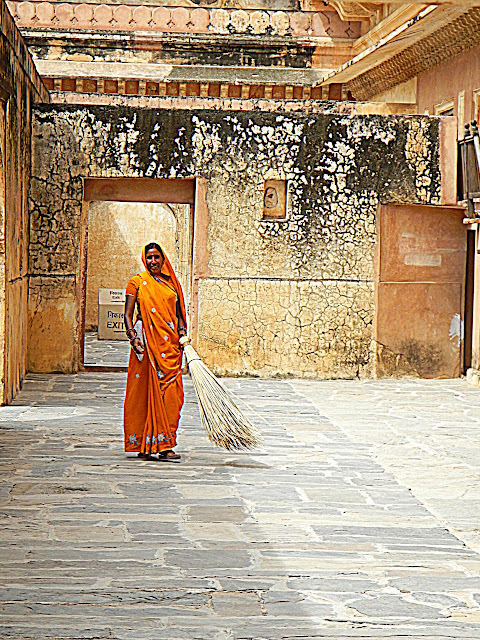 Before we left I'd heard that it was impossible to go to India without getting sick. During the entire 32 days of travel, after eating Chinese, Tibetan, Nepalese, Bhutanese, and Indian food, I suffered from intestinal distress only twice and each time was a one time event. Both were in China. That was it. I credit this to the yogurt and probiotic regimen I put myself on before leaving. Sadly, on the last day, things caught up with the Wife. After getting home she was down for the count for about five days. Except for feeling a bit jet lagged and tired I felt fine. After worrying that many of the places we were going would not meet my expectations, I was always surprised how much better the places were in person. Pictures can only give you a superficial taste of a place. Being there is a completely different experience. Thirty-two days of travel, especially the intense guided tour type of travel, is very close to my limit. I was exhausted at the end of many days and I let this nearly make me sick at times when I didn't eat and drink enough. The Camino was longer but didn't have the intensity of this Asian trip. I think we may have to limit these types of tours to three week spans from now on. One other thing happened on this trip. I can now say that I have traveled around the world. The thirteen flights we took during this vacation took us completely around the world. I hadn't really considered this when I was setting up the trip but it's a fun little extra. To make it better, we never missed a flight and our bags were never lost. Pictures from the China portion of our travels can be found in my 2012-06 China Google Photos album. Pictures from the Tibet portion of our travels can be found in my 2017-06 Tibet Google Photos Album. Pictures from the Bhutan portion of our travels can be found in my 2012-07 Bhutan Google Photos album. 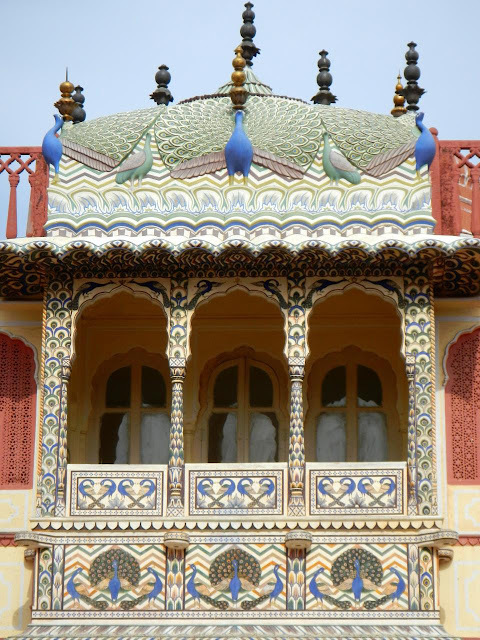 Pictures from the India portion of our travels can be found in my 2012-07 India Google Photos album. Onward to our next adventure ... whatever that may be. As we flew into Delhi I made the mistake of realizing that in exactly a week I would be going home. This meant that I'd been on the road for three weeks. As the plane made its approached I suddenly felt very tired. I worried that it would prevent me from enjoying India. I can't say I was as enthusiastic as I was in China at the beginning of the trip but I did manage to enjoy India. India had been added to the trip almost as an afterthought. We were going to China, Tibet, and Nepal. As we planned the trip I kept looking at the map and seeing just how close India was from where we were going to be. India was not at the top of either of our lists. But, after making the mistake of not also doing Turkey and Egypt when we went to Jordan, not doing India would have been a mistake. Having said all this, India exceeded my expectations. It was crowded. It was noisy. It was dirty. Traffic was a nightmare of horse carts, camel carts, rickshaws, motorcycles, cars, and trucks, many with horns, all mashed up together. Beggars tapped at the car windows at stop lights. 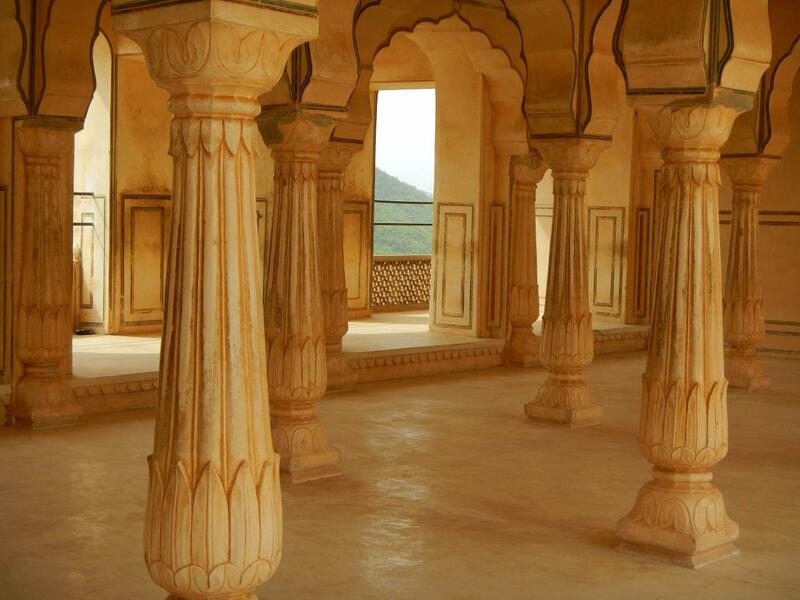 It was also a country of incredible architecture and beauty. A country of rich and deep history. A country and culture so different from my own. My expectations were blown away. Yes, I was tired from all our travels up to then - a fact that mystified me as I'd been on the Camino for forty-nine days and never felt the weariness that I was starting to feel. Yes, I sweat my a$$ off almost every day in India, but when I realized just where I was and what I was seeing, I got a second wind ... or at least an extra half of a wind ... and enjoyed the wonderful things that were around me. Oh, and I enjoyed the Indian food. I'd worried about this a lot before the trip started. Needless worry. One last thing about India. One of the Wife's favorite little details I think. The doorman at our hotel in Delhi. He was tall ... very tall. He dressed in flamboyant white with a large white turban. He looked like a sultan from a storybook. His facial hair ... immaculately groomed and exceptional. He greeted us every day we were in Delhi and tried his best, unsuccessfully, to open the car door before we could. A touristy detail, I know, but he made me smile every time I saw him. Pictures from India portion of our travels can be found in my 2012-07 India Google Photos album. Day Twenty-Nine - Happy Birthday To Me! Day twenty-nine, the last 'real' touring day of our Asian adventure, just so happened to have fallen on my forty-ninth birthday. I'm not a big birthday celebrator, though my attitude towards them is improving slightly (I no longer mope all day long), but being in Jaipur, India on my birthday ... it was kind of cool. We were picked up by our driver and guide and headed out. First stop was a drive by the Palace of the Winds. 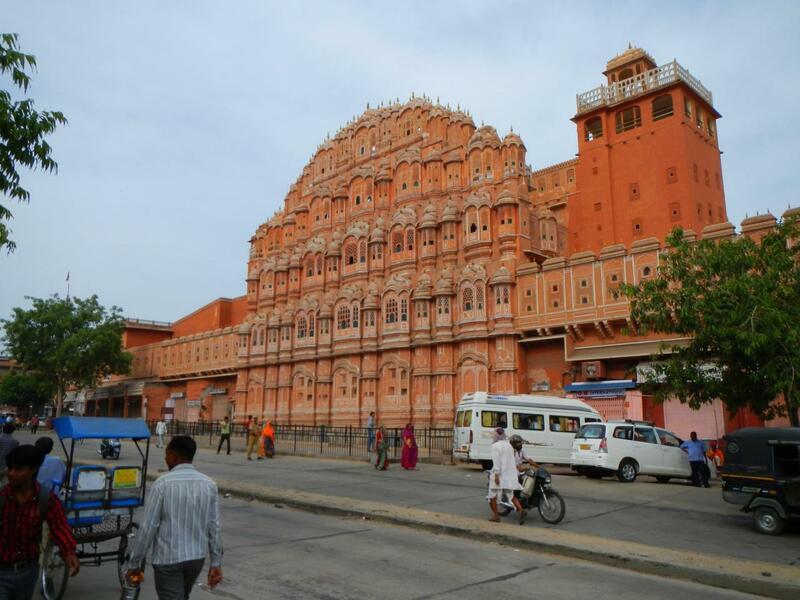 The palace, designed to look like Krishna's crown, was built to allow the royal women to see the activity in the street below without being seen. Our car stopped long enough to get out and take some pictures of the magnificent facade. I also got a good picture of a camel cart. 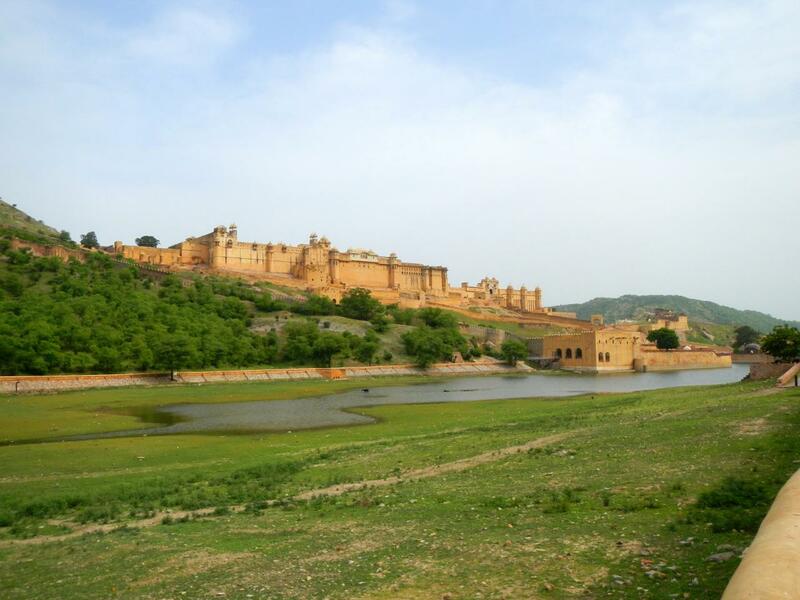 The next stop was the Amber Palace (Amber Fort, Amer Fort). The palace is located at the top of a hill. You could have walked up the hill but there was a more interesting, if not a bit touristy, way to go up to the fort. You can ride an elephant. Waiting for our elephant ride. We stood in line to get on our elephant. We'd been warned about all the people who would try to sell us junk. We were told to ignore them. We ignored them and we were not bothered. A poor lady in front of us must not have gotten the memo. She showed interest in some doodad and that opened the floodgates. They harassed her, tag-teamed her, and followed her and her elephant nearly all the way up the hill. Our turn came and we got on our elephant. We rode sidesaddle as it slowly followed the elephant parade up the hill. The elephants only work for a few hours in the morning and head home before it gets too hot. The treatment of elephants is carefully watched to ensure no abuse. 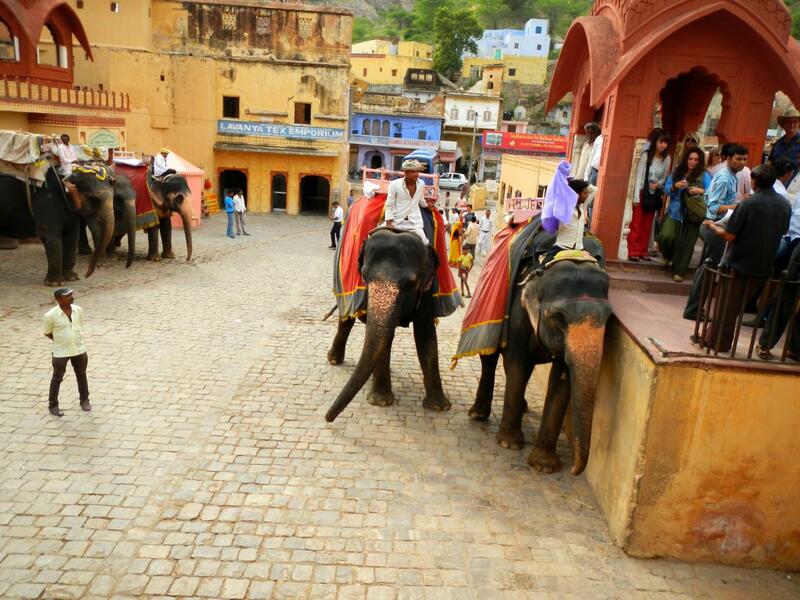 As our elephant entered the walls of the palace we handed our camera to our guide so he could take pictures of us. It was interesting. I can't say it was fun but it was a new experience. Riding animals have never been on my to do list but sometimes you just have to give in and do the tourist thing. We toured the palace. It was extensive and intricately decorated with vistas of the surrounding hills, the old city walls that ran along the hills, and the city of Jaipur. There were other travelers touring the place including a group of high school/college age kids. As we waited out turn to enter the next part of the palace the group became a flash mob and did an impromptu Bollywood sing and dance routine which had everyone laughing and clapping. A smile in the Amber Palace. After the Amber palace we stopped briefly to see an island fort not open to the public yet before stopping at the obligatory shopping stop. This one had to do with block printed table cloths and fabrics. We watched and participated in a a demonstration of how the patterns are made using overlapping blocks of different colors. We bought two table clothes and talked about American politics with the store owner as we waited for the credit card to go through. We went back to the hotel for lunch before heading out one more time. 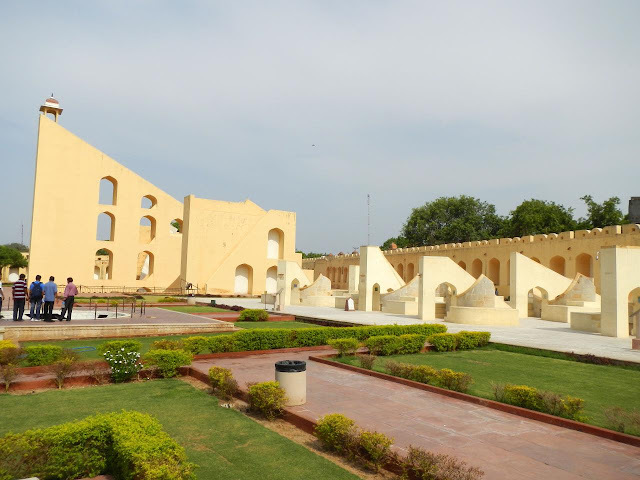 This time we went to Jantar Mantar, a large astrological observatory with amazingly accurate sun/moon/star driven instruments. The highlight here was a 90 ft (27 m) tall sundial - the tallest in the world. Its shadow moves at 1 mm per second (2.4 inches per minute). The complex was built almost three hundred years ago (and refurbished in 1901). There is an instrument for each astrological sign. By coincidence our guide stopped to explain about them in front of my symbol, cancer. Jantar Mantar - on the left is the tallest sundial in the world. From the observatory we walked to the nearby palace museum. I took an obligatory picture of a snake charmer ... and almost caused a riot when he thought I wasn't going to pay for the privilege of taking his picture. The museum was interesting. Lots of old weapons for some reason. There was no AC in the museum and the Indian heat was getting to me by the time we left the building. The palace was very beautiful but I think my ability to appreciate it all was slowly wilting. After we left we went back to the hotel and cooled off for the rest of the afternoon. This day was a transition day. We got in the car and we drove back to Delhi. It was about an eight hour drive. We stopped at a small roadside restaurant and had some good food along the way. This was the one and only day in India I did not sweat through my shirt by the end of the day. It felt good to be in an air conditioned space even if it was a car. It was our last day in India. Originally there was nothing planned for this day and, after talking to the tour company representative (who kept calling us to find out how we were doing ... every day!) we discovered the plan was to check out late morning and go to the airport over ten hours early. We negotiated with the tour company and the hotel and managed to add another tour stop this morning and to extend our time in the hotel so we wouldn't be sitting in the airport for so long. The extra stop, actually just a stop we'd postponed from our first day in India, was the Akshardham Temple complex, a modern Hindu temple. The temple was opened in 2005. It is an impressive complex. No cameras are allowed in the temple (you go through a strict security checkpoint where all cameras and cell phones are taken and put in lockers before you can go in). We walked around the main temple with its engravings of elephants. To go in the temple you have to remove your shoes and leave them at a shoe check area. After you remove your shoes you are warned to only walk on the white tiles. This is totally understandable since, even mid-morning, the dark colored tiles were hot enough to roast your toes. We toured the temple and marveled at the intricate decorations before going back out and retrieving our shoes. Next stop in the complex was a "show" that would tell us about the history of Hinduism. There were two lines - one for native speakers and one for English speakers. The English speaking line was only three or four people long but they made us wait as several groups of native speakers went in. We were in the shade but it was still hot. My shirt sweated through first. Then I noticed what I thought was a stain on my pants. Closer inspection made me realize that I was sweating through my pants. I have never sweated through my pants before. The heat here was insane. They finally let us in where is was cool. A recorded narrative took us from room to room where we watched, and I kid you not, animatronic figures illustrating the history of Hinduism. I wasn't sure if I was at a Hindu temple or at Disneyland. It was informative but also a bit cheesy. After the show the next stop would have been an IMAX history of the child-yogi and a boat ride "through 10,000 years of Indian culture". All I could imagine was the Tunnel of Love. We both had enough. We were hot and already sapped of all strength so we skipped these, walked through the gift shop, and headed out looking for our driver. I think he was surprised we came out so soon. Back to the hotel for a nap, shower, fresh clothes, and lunch before heading to the airport for flights numbers twelve and thirteen (a fifteen hour international flight followed by a three hour domestic flight). Security at the Delhi airport was crazy. You had to go through security a couple times. We walked to our gate and sat own. That's when someone realized that we were not being checked when we entered the gate area so we all had to leave the gate area and re-enter. Some X Rays, magnatometers, and wandings later and we were back in the same seat we'd been sitting in earlier. You couldn't bring food and drink to the gate (and I didn't have change for the vending machine in the gate area) so I sat there reading my book hungry and thirsty until we finally got on our plane. This ended up being a very long day. Pictures from days twenty-nine (07/20/2012) can be found in my 2012-07 India Google Photos album. No pictures were taken on the last two days. Our 2012 Asian Adventure comes to an end.